This week we are planning to run a five day series of blog entries about a maverick who was involved at the start of the very start of the record business when its pioneers were searching to find the best business model to capitalise on the new sound-recording and playback technology. Russell Hunting was a right man in the right place as the record business came into being. An intriguing mixture, he was part entrepreneur, part rogue, funny, unconventional, sometimes the artist and occasionally a business executive. Things appear to never have been dull when he was around. This is day #1 of 5 about the early years of Russell Hunting, a big extrovert so retrospectively elusive that we can only find this one very small photo of him. Hunting was born in 1865 and would have been 12 years old when Edison invented the phonograph and 29 and working as a thespian by the time that he (perhaps inevitably) entered the orbit of Fred Gaisberg. When Gaisberg threw in his lot with Emile Berliner’s new gramophone business, his primary role was to make recordings that Berliner could use to demonstrate the quality of his new invention. 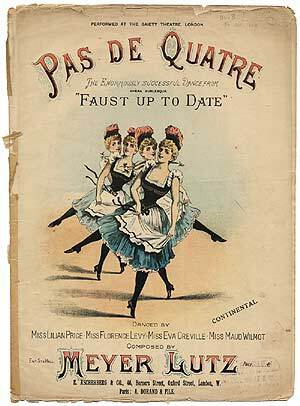 After he had completed the first batch in 1894 Hunting burst into his life, “The much advertised Burlesque show entitled Faust Up-to-Date visited the Albaugh Theatre next door to our lab which was at 1410 Pennslyvania Avenue, Washington. The stage manager was Russell Hunting. 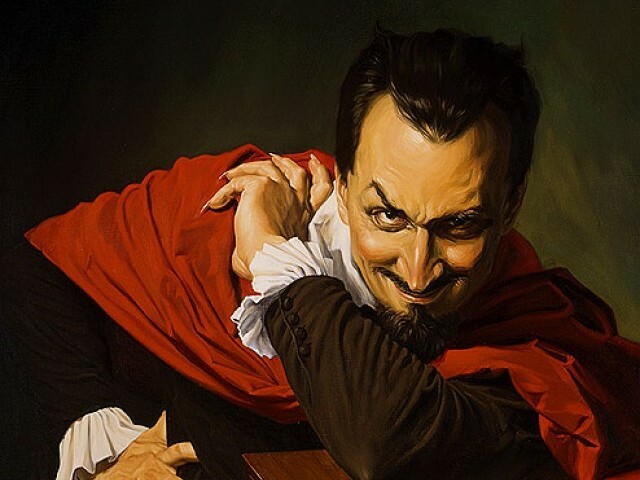 He also played the part of Mephistopheles, and, dressed in red tights was shot up from the bowels of the theatre into the midst of a bevy of dancers. I knew him as the originator of the “Michael Casey” series of Phonograph records. They consisted of rapid-fire cross-talk between two Irish characters, with Hunting taking both parts. His fine voice had an infinite capacity for mimicry. In his spare time he made these cylinder records in his hotel room and they had become famous among exhibitors. A wider catalogue of Hunting’s recordings are available on the Charm website, here. This entry was posted in 1894, HISTORY OF RECORDED MUSIC, Uncategorized and tagged 1865, 1894, albaugh theatre, burlesque, CHARM, emile berliner, fred gaisberg, james bond, mephistopheles, michael casey, patrick feaster, russell hunting, washington by Nipper. Bookmark the permalink. Great information on Russell Hunting, I appreciate the stories. Do you have any stories about Cal Stewart, performer of the Uncle Josh sketches? Thanks Morgan- I love to knwo more about Cal Seward… however if any SOTH readers do please share with us!